The St. Albert Slash became the first team in Esso Cup history to repeat as back-to-back champions, defeating the Saskatoon Stars 2-1 to win gold at Canada’s National Female Midget Championship. “They [St. Albert] did a great job. 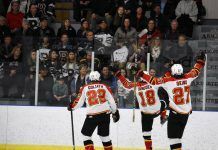 An absolutely great job,” said Greg Slobodzian, head coach of the Saskatoon Stars. “We haven’t been pressured like that in a long time. Our girls didn’t know how to handle it at the beginning, but I thought we answered really well in the third period. It could have went either way. Meropoulis (Edson, Alta.) lead the Slash with one goal and one assist in the final, while veteran Madison Willan (Edmonton, Alta.) recorded the game-winning goal in the second period. Jayme Doyle (Calahoo, Alta.) also registered one assist in the game. Goaltender Camryn Drever made 14 saves on her way to securing the win, while Mackenzie Butz earned player of the game honours for St. Albert. The 2018 Esso Cup top goaltender, Sarah Vanier (Saint-Gabriel-de-Brandon, Que. ), earned her third win of the tournament as the Pionnières de Lanaudière rebounded from Friday’s semifinal loss to win bronze. 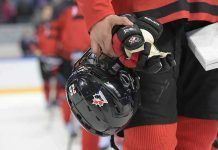 The Pionnières suffered an 8-2 loss at the hands of the Canadettes in the preliminary round, a game that saw six different Canadettes skaters record at least one goal. Mégane Quirion (Saint-Lin, Que.) and Ann Sophie Guay (Lachenaie, Que.) recorded goals for the Pionnières, while Vanier recorded 29 saves on 30 shots in bronze-medal game.